Beta-carotene is a red-orange but sometimes yellow pigment that naturally occurs in plants, fruits, and vegetables, especially carrots. It is an organic compound which is chemically classified as a hydrocarbon and in particular as a terpetenoid. Beta-carotene serves as a provitamin because our body can convert it into vitamin A (retinol) after oxidative cleavage by beta-carotene 15, 150-dioxygenase. This means that beta-carotene is the precursor of vitamin A. Other carotenoids, such as lutein, lycopene, and zeaxanthin cannot be converted into vitamin A by the body. Beta-carotene can also be manufactured artificially from algae, fungi, and palm oil. Cooking foods that contain beta-carotene can improve your body’s nutritional content of this compound; however, overcooking should be avoided to prevent beta-carotene from changing into its cis-formation. Foods that are rich in beta-carotene include apricots; asparagus; broccoli; carrots; Chinese cabbage; chives; dandelion leaves; grapefruit; herbs and spices such as chili powder, oregano, paprika, and parsley; kale; ketchup; margarines; onions; peas; peppers; plums; pumpkin; spinach; squash; and sweet potatoes. Smokers and heavy drinkers might take care to avoid intake of beta-carotene supplements, though. Two studies showed that they will develop an increased risk of heart disease and lung cancer if they take more than 20 milligrams of synthetic beta-carotene as supplements. When smokers and heavy drinkers ingest beta-carotene as part of natural food, however, there are no risks of such developments, according to a study conducted by the Harvard School of Public Health that was published in the July 2004 issue of Cancer Epidemiology Biomarkers and Prevention. Some medications, such as weight-control drug Orlistat, can undermine the absorption of beta-carotene by up to 30 percent, bringing about lower blood beta-carotene levels. Beta-carotene has anti-cancer properties. It shields the cells from carcinogenic effects of harmful free radicals. The body’s susceptibility to damage from free radicals, which include incurring the risk of heart aiolments and cancers, increases when the body is lacking beta-carotene. Beta-carotene has anti-aging properties. It reduces the damage incurred by the skin that gets exposure to the harmful rays of the sun, as beta-carotene is one of the many carotenoids that can be converted to vitamin A or retinol, providing a natural glow to your skin. It can also treat oral leukoplakia, a condition which is characterized by white lesions around the mouth or on the tongue and is caused by excessive years of smoking and drinking, and scleroderma, which is a condition that is characterized by skin thickening, spontaneous scarring, blood vessel disorders, and varying degrees of inflammation. Beta-carotene is good for the hair. It can help address problems such as a dull and lifeless hair and a dry scalp. Beta-carotene has anti-inflammatory properties. It can serve as treatment for rheumatoid arthritis. 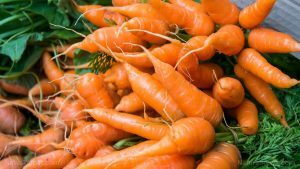 Beta-carotene is good for the immune system. It provides for the health of our mucus membranes. Beta-carotene is good for the ocular system. It provides for good eye health and proper vision. Beta-carotene is good for the central nervous system. The antioxidant supplements in beta-carotene lessen the negative effects of oxidative stress that impairs cognition. Beta-carotene is good for the respiratory system. In a report that was published in the British Medical Journal in March 2006, high blood beta-carotene levels were shown to heal some of the damage to the lungs that was caused by harmful free radicals. Beta-carotene is good for the muscular system. It initiates communication between cells by improving the expression of a gene that codes for connexin proteins, which facilitate gap functions among cell membranes, thus allowing the cells to communicate through the exchange of small molecules. Beta-carotene is good for the cardiovascular system. It works with vitamin E to decrease the oxidation of low-density lipoprotein cholesterol, thereby reducing the risk of heart ailments such as atherosclerosis and coronary heart disease. Beta-carotene is good for the immune, ocular, central nervous, respiratory, muscular, and cardiovascular systems. Beta-carotene is good for the hair.